Between March and July this year, in total 18 European bison calves have been born in European Rewilding Network member areas. These (semi-)wild new-borns add up to the total number of 5555 individuals registered in the European Bison Pedigree Book (December 2014). The European bison is still listed as ‘vulnerable’ on the IUCN Red List of Threatened Species, although in many places in our continent great work is ongoing to create a better future for the species. All these initiatives help the European bison to roam more of Europe’s natural and semi-natural landscapes. 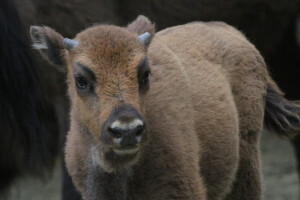 Five European bison calves born in Kraansvlak, the Netherlands. 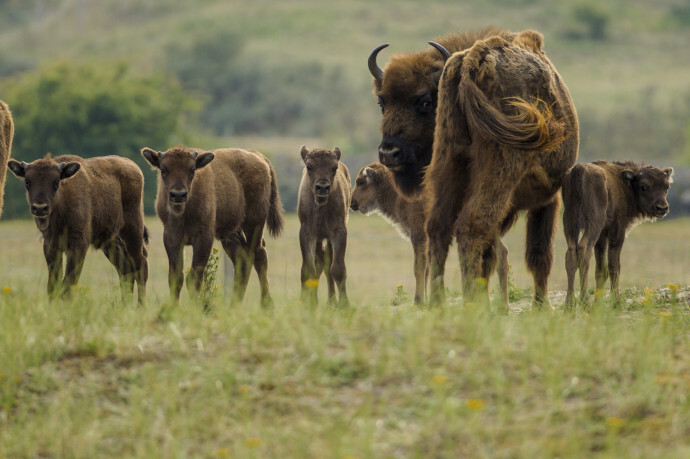 Most of the 18 calves – a number that equals a small new herd – have been born during the natural calving season of European bison, spanning May to July. Calves were welcomed to four ERN member sites and two Rewilding Europe areas, covering five different countries. In the Netherlands, five bison were born in the Kraansvlak dune area where a natural grazing project started in 2007 with six animals originating from Poland. Here, no additional feeding allows a year-round monitoring of grazing impact, adding valuable information to the current ecological knowledge of the species. The herd currently consists of 22 animals as two bulls were translocated to Spanish bison areas in early August. Another member of ERN in Spain, Atapuerca, received one of the Dutch born bulls that met up with two females to start a new reproductive herd in an area where wild horses and cattle roam. The herd currently consists of 22 animals as two bulls were translocated to Spanish bison areas in early August. In Swedish Eriksberg the herd was enlarged with one bull calf adding up to a total herd size of 49. In July there was an anniversary celebration of twin calves born here in 2012. It is quite unusual for a bison cow to give birth to more than one calf at a time, and it is even more remarkable that both calves survived and are doing very well. In the German Rothaargebirge, besides seven bison being present in an enclosed area, a small number of bison was released into the wild in 2013. This is the first reintroduction of bison in Western Europe where animals are allowed to roam freely. In this free roaming herd, five calves were born this year; one of them parented by a cow that herself was born in Rothaargebirge. Bull calf born in June 2015 in the Southern Carpathians rewilding area, Romania. Likewise, Vanatori Neamt in Romania also welcomed three calves into the semi- free herd (18 animals) and two calves into the wild herd (20 animals). With 16 calves born in these ERN member areas, their total number of bison after this year’s calving season is 136, all included in the species Pedigree Book. In the Southern Carpathians rewilding area a bull calf was born in June, contributing to the total number of bison present to 29. In the Rhodope Mountains rewilding area, two present bison originating from Germany surprised the team with the first calf being born here. Finally, in Eastern Carpathians rewilding area where females from Eriksberg were released in December 2014, new-borns are expected in the near future. Less than a hundred years ago, the European bison went extinct in the wild mainly due to loss of habitat and poaching. To prevent Europe losing its bison forever, great efforts were undertaken. A breeding programme with captive animals started, aiming to release bison back into nature. Still, the European bison is not out of the danger zone and considered as ‘Vulnerable’ by IUCN’s Red List. In 2008, the European Bison Conservation Centre (EBCC) was established to bring the preservation of Europe’s largest land mammal to the next level. Since 2014, EBCC and Rewilding Europe joined forces to work together towards a brighter future for this keystone species. 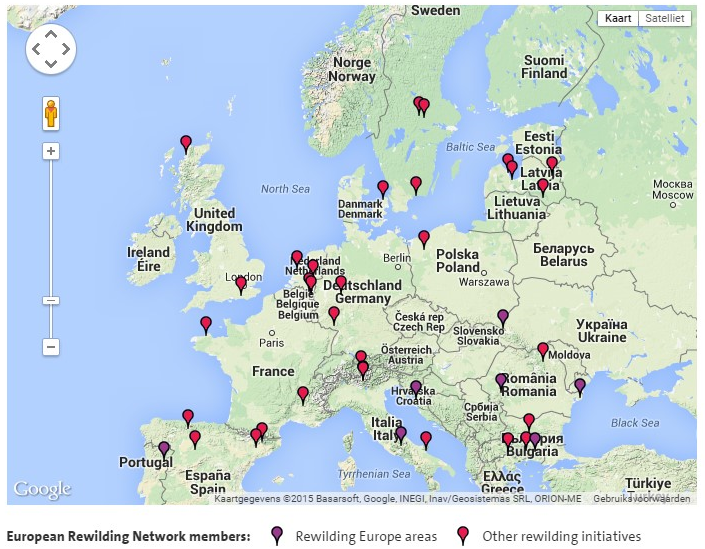 Map showing European Rewilding Network (ERN) members and rewilding areas. Within the last decades, a considerable amount of new bison breeding and reintroduction projects started all over Europe, within the historical range of the species. Rewilding Europe recognizes the importance to bring back this magnificent large herbivore to European landscapes. In its ‘Bison Rewilding Plan 2014-2024’ Rewilding Europe describes its strategy and planned efforts for a period of ten years to help safeguarding the species, which is also a great drawcard for rewilding European landscapes. Together with many partners, notably EBCC and a large number of zoos and wildlife breeding centres from across Europe, Rewilding Europe works to create viable populations of the species in a number of rewilding areas. One of the areas taking huge steps towards creation of a new, wild population of European bison is the Southern Carpathians rewilding area in Romania. In 2014 and 2015 bison have been translocated to this area, in particular the Tarcu Mountains Natura 2000 site, being the first two of a long series of translocations to build a viable population in this area. Besides rewilding initiatives supporting the presence of more natural numbers of key wildlife species such as European bison, Rewilding Europe warmly welcomes many more rewilding initiatives to join the European Rewilding Network. See here how you can become part of this growing and experience-sharing network.